Music and entertainment is the most important factor to the success of any event. When you choose Executive Disc Jockey and Lighting, you get more than a DJ; you get experience, quality, and professionalism. There are no gimmick’s, games or disruptive demeanor on the mic. Our work is never sub contracted and the DJ you meet and choose will be the DJ the day of your event. We are actively involved before, during and after your event. With our easy to use on line planning tools organizing your Wedding will be effortless. 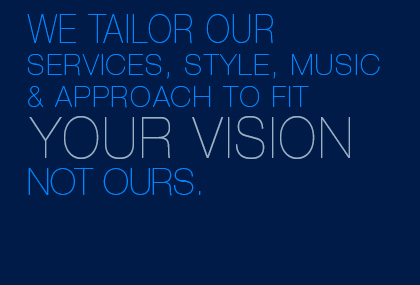 We dress in proper attire, are fully insured and our attention to detail is unsurpassed. With over 20 years of experience you can be assured that you are going to receive the very best entertainment and lighting for your event. Our ability to read the crowd and know what to play allows us to be one step ahead and gives us that extra edge that only comes with years of experience. Our style is simple. We are elegant, enthusiastic, energetic and professional disc jockey’s who have a passion for what we do. The focus is on you and your guests and creating the right mix, vibe and ambiance for your Wedding or event. Our DJ’s are clear and precise on the mic and provide just the right amount of guest interaction that is not too overbearing or disruptive. Our award winning DJ’s are always punctual and prepared. We work together with your Coordinator and all your vendors to assure you that we are all on the same schedule when it comes to order of events, announcements and special requests. We also offer many packages that can make your event a memorable one.